So I don’t know if Wikipedia is wrong (maybe it started in 2010? ), or if NPR was referring to that event coming up in Canada, or if it just happens that we threw our first party at the same time that Wikipedia says it was invented by someone else. Either way, we were WAY ahead on the curve on this one. Well, for that first Star Wars Party, licensed Star Wars Serving Platters , Death Star Waffle Makers and the like didn’t exist… The new Star Wars movie had not been announced, and the new generation of Star Wars mania had not hit yet. These days you go to any store and you can find Star Wars Cookie Jars , C-3PO Bowls and Star Wars Lightsaber Grilling Utensils …you name it…they make it. But 5 years ago, those things didn’t exist. So we had to make our own. 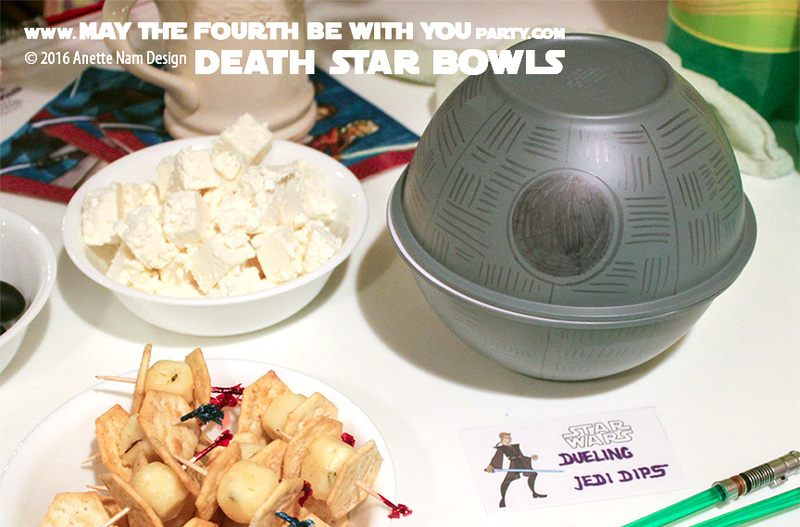 The first thing we made was this Death Star serving bowl set. We got ours from the local dollar store. With the bottoms facing up (you do not want paint on the inside) spray paint both bowls grey. Let dry, repeat if needed. Draw the death star details on with a black sharpie. Our early dishes were pretty simple. This one just had red and green pepper strips (lightsabers) in one half of the bowl, and dip in the other. Easy peasy! There are also cheese and cracker TIE fighters in the picture, but I think we’ll make a separate post for those in the future. And of course in the background you can also see our Yoda Folded Napkins. Love this! I especially love the way you guys tackled this and made it work, even without licensed Star Wars stuff. I love the red and green peppers…very smart. I still have men’s t-shirts from back in the day when finding any kind of Star Wars clothing was tough, much less for a girl. So if I found anything that remotely fit me (usually a youth XL or 16), I would buy it. Now it’s everywhere! It makes me happy but at the same time, it’s gotten rid of the treasure hunt aspect for me. I totally know what you mean. There was a certain thrill to being a big Star Wars fan, when it wasn’t so cool…especially when it was JUST starting to be cool again. It was like we knew something, and the rest of the world was just catching on 🙂 I love that people are enjoying it, and that is popular, but I am afraid it will turn into a big fad, one that will burn out, and then that will be it. In the meantime though, I we will keep making our own stuff, just for fun. But you know… That’s what happened last time and has kind of happened with the superhero movies too. Everyone loved superhero movies when spiderman and iron man first came out. Now it’s only the die hards that go opening weekend. So that may be us with star wars and I’m fine with that. Yup, and then in another 30 years, just in time for taking my grand-kids to the movies, we will be considered really cool again!